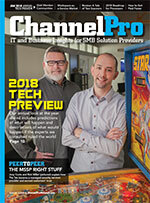 ChannelPro-SMB is the only industry magazine committed to providing targeted business and technology insights for IT channel professionals -- integrators, developers, white-box builders, solution providers and VARS serving small and medium size businesses (SMB).Each issue delivers powerful news, reviews, analysis and advice to help you cultivate your SMB customers, run your business more profitably and get an edge on the competition. Frequency: 4 print issues; 12 monthly digital issues. Print subscriptions are available in the U.S.A. only. A free digital subscription is substituted for all other countries. (how do I find my Subscriber ID? ), or your email address. 3. Please indicate your company'a annual revenue. 6. May we contact you via email regarding your ChannelPro-SMB subscription? 7. May we contact you via email regarding your ChannelPro-SMB products and events? 8. May we contact you via email regarding special promotions or services from partners of ChannelPro? In lieu of a signature, we require a personal identifier. To verify that you submitted this application, please answer the question below. In what month were you born?